This is the world’s original ice hotel, located on the River Torne in Jukkasjärvi close to Kiruna. Every winter, ice blocks and snow are harvested from the river and stored in a refrigerated production area ready for the construction of next year’s ice hotel. When the temperature drops the following winter, construction begins. There are about 80 bedrooms, of which about half are described as Art Rooms and are decorated in elaborate styles by a number of different artists. During the day, the hotel and all the bedrooms are open for visitors to wander around, but in the late evening the rooms are for guests only. The temperature inside the bedrooms hovers at about -5deg C, but guests are provided with sleeping bags and are advised to wear hat and gloves, so the whole sleeping experience is actually quite toasty – unless you have to go out for a call of nature during the middle of the night! Guests staying at the hotel spend just one night in an ice room. For our second night at Jukkasjärvi we stayed in one of the small (heated!) wooden chalets in the hotel grounds. 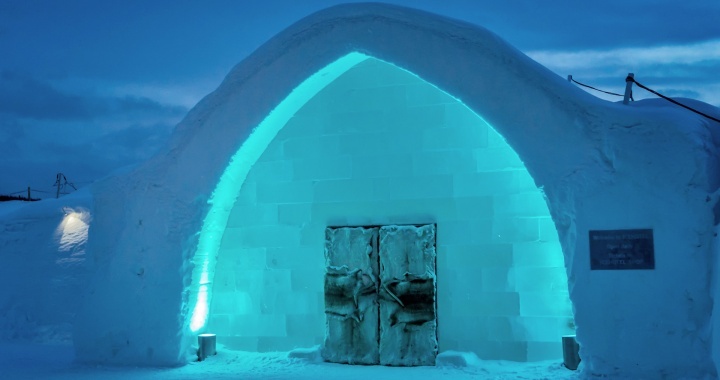 There are also numerous other buildings and ice sculptures at the hotel – most notably an ice bar in the shape of an igloo, which is lit from the inside at night. On the evening that we arrived at the Ice Hotel, we ate out the Old Homestead restaurant – about a 15 minute walk from the hotel. On the way back we noticed that the clouds were clearing, so grabbed our cameras and sure enough caught a first sight of the Auora. Not ideal conditions with the lights of the hotel and some cloud about, but it did mean that our main purpose of visiting Sweden had already been achieved. The following day, we took some photographs around the Ice Hotel and in the evening took a walk along the River Torne. In winter, the river freezes completely, so is completely safe to walk upon. In fact cars there is a road bulldozed across the frozen river so that cars can avoid a few miles detour to the nearest bridge. One of the ativities at the hotel is a snow mobile tour. All the clothes and equiment are supplied, and we were well wrapped up against the cold. The tour starts from Kiruna, and goes out into the countryside. At our first stop, we had views back to the city which is dominated by the iron mine – the largest in the world. Our second stop felt like it was in the remote wilderness, looking towads the mountains in Norway. The snow mobiles were not too difficut to control as we were on prepared tracks, and it wasn’t long before we could pick up some speed over the flat open terrain. The day after the snowmobiling, we had the chance to try out some dog sledding. We were kitted out like Arcic explorers and given instruction on controlling the dogs, before we set out into the woods. The dogs knew the route, so required little direction, other than a bit of help pushing up some of the slopes. We were surprised that the dogs were quite small, but they seemed very strong for ther size, and we were told that they could run all day long if necessary. Out in the woods, we stopped at a campsite for some well deserved hot soup. After the dog sledding, we transferred to the small town of Abisko for the next three nights. This would be our main location for viewing the aurora.